The impact of refugees coming to North America has everyone talking right now. For most of us that might mean seeing just a handful of people who obviously aren’t from here, in the grocery store or in our classroom at school. Can you imagine if suddenly people flooded your town, looking for a place to live? That’s the reality in much of Rwanda, where Food for the Hungry (FH) Canada works. 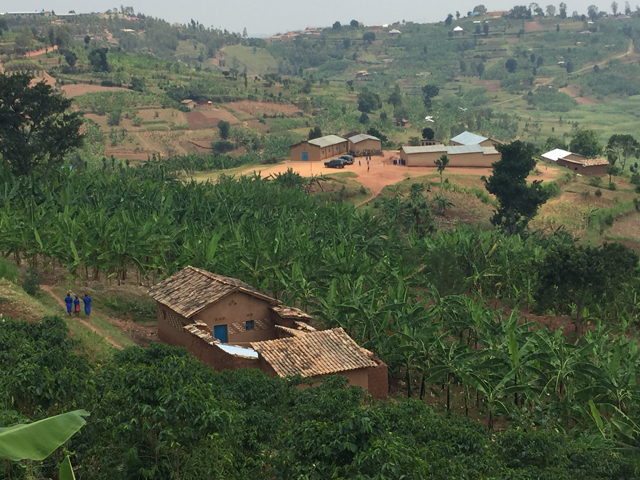 Decades of strife forced families from their homes in towns like Busekera, Rwanda. They fled to neighboring countries like the Democratic Republic of the Congo or Uganda, to escape bloody violence. They ran for their lives, literally, when some 800,000 people were murdered in the 1994 genocide. And then, they came home again. Former refugees flooded back home after the genocide. There wasn’t enough land, water, schools and health posts to meet the needs of the swelling population. 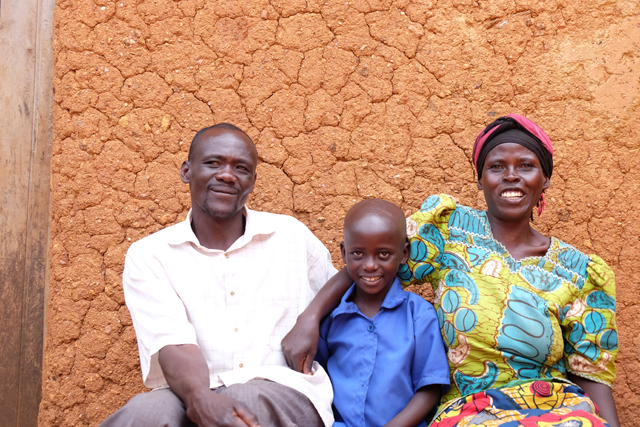 Viateur and his wife Venantie lead a family with three daughters in Busekera. They’re trying to scratch a living out of a small plot of ground. With so many people crowding back onto the land, it was nearly impossible to feed a family with the microscopic plots each household claimed. Life was really hard for them before FH entered the community five years ago, funded by sponsors from Canada. “We were in a miserable condition because we didn’t have enough to eat,” says Venantie. Her eight-year-old daughter Vestine, just home from school and still in her blue uniform, hugs her close. “For this child, I had to attend a therapeutic feeding centre to fight off dangerous malnutrition,” Venantie says. Therapeutic feeding centres usually take children who are just one serious illness away from death. Today, Vestine would be tall for an eight-year-old even in Canada, with no evidence of ill health. And she’s in school, something women her mother’s age couldn’t have hoped for. How did this family turn the corner from barely hanging on, to having hope for the future? First, FH helped them produce more food, and foods with better nutritional value. Traditional staple crops like cassava, corn, and beans fill every spare inch of ground here in Busekera. FH took what they knew, and helped them make it better. FH also provided seeds for vegetables they’d not grown before. Cabbage, beets, onions, and leafy greens provided vitamins and nutrients their children didn’t have. They could kiss goodbye to the specter of death by malnutrition that had hovered over the family. But there was one more secret weapon FH brought: Diary Cows. FH provided some families in Busekera with an improved breed of cow, specially bred to produce more milk than the local cattle. This gave the family a protein source they could count on each day. While Viateur and his wife talk, not one but two animals – mother cow and calf — punctuate the conversation with healthy bellows. Aside from milk, and occasional meat, the cattle produce manure used to fertilize the fields. “Thanks to manure from the animals, my land productivity is increasing compared to before. There’s no change for my neighbors [who don’t have cows] because they can’t afford the manure,” Viateur says. He points out that his coffee leaves are a rich green, while those of his neighbors who don’t use manure are an unhealthy yellow. You can measure the change in Busekera by more than milk and bean production. Attitudes have changed, too. 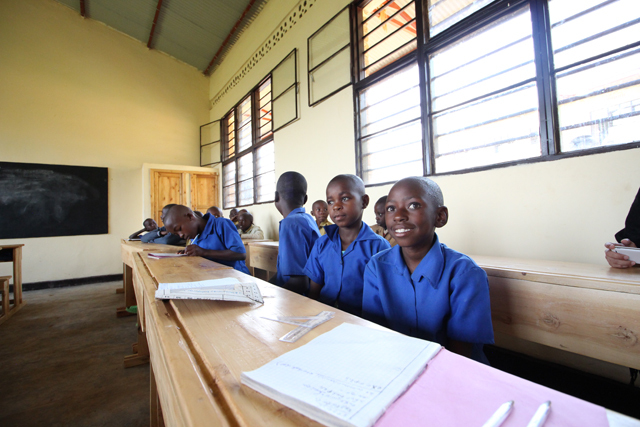 Through FH’s efforts, the number of children attending primary school in Busekera has doubled. The growth quickly overwhelmed the old six-classroom school, so FH helped build new classrooms. Viatur reports that the successes in farming contributed to the rise in school attendance. “Children now attend school because they have something to eat, and when they leave school, they get something to eat,” Viateur says. 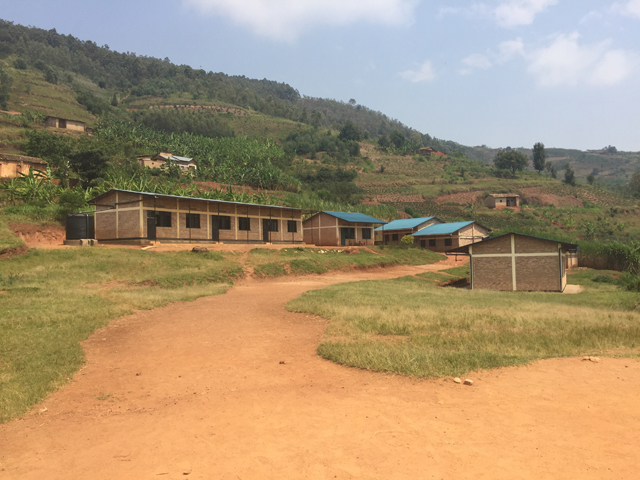 New classrooms (and accompanying latrines) in Busekera, used for the upper primary grades. Even with these new classrooms the school still needs to run in two shifts each day to provide space for all students. Behind the school, you can see the slope that farmers like Viateur fight against when attempting to plant crops. At the crest of the hill outside his yard, where Viateur raises corn and coffee, green sprays of tall, thick grass grow. This is what he feeds his cows. FH Rwanda staff point out what we can’t see – that this grass has been carefully cultivated, with all the weeds removed so the grass can grow tall. This represents a change in attitude as well: When you work hard, there’s hope that things will be better. 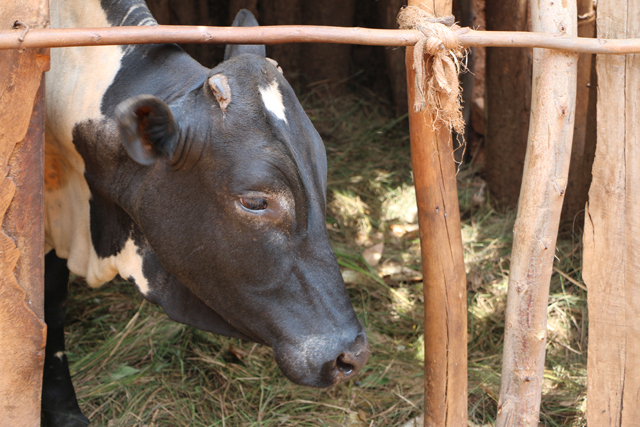 Consider helping Rwandans like Viateur, Venantie, and Vestine by donating to FH’s dairy cow distributions. Inside some of the new, well-lit classrooms. During the trip where this story was collected, we saw electrical lines being laid some distance away. Eventually, electricity should reach here, too. So the new classrooms have been wired for electricity in preparation for the arrival of power. About Beth Allen: I'm a self-professed sustainable development geek who would have a very hard time picking a favorite country. That means, I love every tribe and nation and take great joy in seeing how God is working in the world. I've been with FH for nearly two decades, and started out by serving with them in the Bolivian Andes. I can't live without Jesus and coffee, but the coffee is mostly decaf so the power is from Jesus.